When I was deciding to come back to the blog I was looking through all the blogging memes that the blogs I read follow. I had done Book Beginnings and The Friday 56 a handful of times, but over at Mixed Book Bag, JC merged them together and I really like that idea. So borrowing from her I'm going to start linking up to both Book Beginnings on Friday from Rose City Reader and The Friday 56 with Freda's Voice. 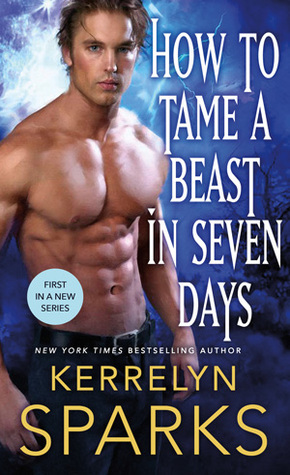 This week the book How to Tame a Beast in Seven Days by Kerrelyn Sparks caught my eye. In another time on another world called Aerthlan, there are five kingdoms. Four of the kingdoms extend across a continent. There, the four kings thirst for war. Luciana spun around to find Tatiana smirking at her. She glanced around quickly to make sure they were alone, then whispered, "What are you doing here?" With a shrug. Tatiana glided up to the railing. "Did you expect me to stay where I was buried?" This is book on in the Embraced series. I started with book 3 (which is due out end of March) as an ebook ARC from Netgally and really enjoyed it so I decided to come back and start with book 1. I'm only a chapter into the book, but can tell I'm going to enjoy this just as much as book 3.